Rusty has worked in racing for the past 20 years and has been crew chief for Ray Black, Jr. since 2007. Rusty spent the first weeks of 2011 getting the racing equipment ready for competition, “Team Scuba will be sporting a newly designed race car and plans to be a top contender at every race”, says Rusty. Robert has been a race car mechanic, commercial diver, and race enthusiast his entire life. and competitor most of his adult life “I look forward to the challenges of competing in the 2011 racing season,” says Robert. He is also responsible for the transportation of all equipment and personnel for Team Scuba. Francois has been working and mentoring Ray Black, Jr. since 2006 and has been involved with NASCAR for two decades. “I look forward to another successful season with Ray Black, Jr. at the wheel,” says Francois. 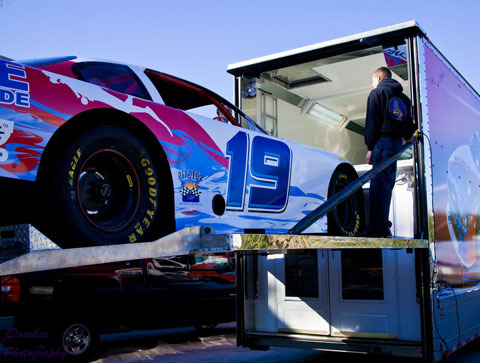 Rudy is a professional Transporter driver and works with several other NASCAR teams providing logistics and setup across the nation. TEAM SCUBA's home is the Deep Water Training Center in Ocala, Florida. Our facilities also include a shop in Orlando, Florida.